More than half (55%) plan to spend $500 or more on a new TV in 2016. Nearly half (46%) of the consumers planning a new TV purchase for 2016 will buy their first 4K TV, while only 4% said they already own a 4K TV. While 41% want new 55" or bigger TV screens, 43% want new mid-sized screens (40-54"). Only 5% said they will buy TVs 70" or bigger. Nearly half surveyed (46%) say "price" is most important when making TV purchases (60% for those under age 30). "Features" came in second at 36%, while 18% said "brand" most influences their purchase (up 38% over previous year). While in-store purchases remain the highest, 1 in 4 will buy their new TV online or via mobile this year. "Consumers are getting more comfortable buying their big screen TVs online," stated Brent Shelton, FatWallet online shopping expert. "Early Super Bowl sales offer shoppers an opportunity to save an average of 20% or more on high-end TV clearance in January, and get them delivered in time the Big Game." Super Bowl 50 is on February 7. There are now only three weeks left until the big game and retailers have started to offer Super Bowl TV sales. Check out the Super Bowl TV deals on Walmart, Best Buy and Amazon. 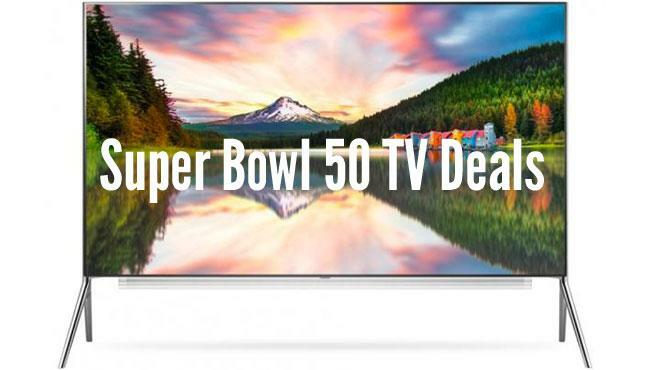 The only problem with the Super Bowl TV sale is that many of the 2016 TV models announced at the CES 2016 are not released yet. Alone for this reason I prefer to find a TV deal during Black Friday and not ahead of the Super Bowl. The complete 2016 TV Buyer Survey can be found here. Marketers are flocking to Super Bowl 50 and it will be a huge TV event. Read our Super Bowl 50 Facts to learn everything important about Super Bowl 50. Read the latest Super Bowl 50 News.